Samsung is all set to release the second generation Exynos 5 octa chipset , The chipset might be called Exynos Evolved and will be officially presented next week. So far samsung just claims tha it’s "a more powerful, enhanced Exynos 5 Octa". and will offer improved gaming performance. Samsung promises to bring detailed specifications and more details on the new Exynos next week. Then we'll learn more about its GPU and the exact clock speed of its eight cores. 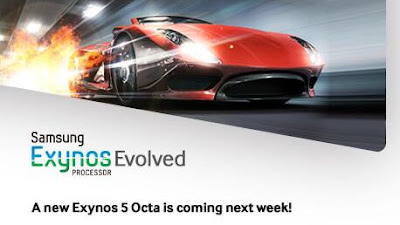 The new Exynos 5 Octa will features a quad-core ARM Cortex-A15′s clocked at 1.8GHz and 4 “smaller” Cortex A7′s cores clocked at 1.3GHz in a big.LITTLE configuration , which will be 20% faster than the predecessor. As we suspected the biggest improvement will be the new six-core Mali-T628 MP6 GPU (an industry first) that is said to deliver 2x’s more 3D graphics power vs their previous model.